1. Apparently, a Manassite warrior who, during the conquest of the territory east of the Jordan, made himself master of Kenath and the villages thereof and gave them his own name (Num. xxxii. 42). According to Seder 'Olam Rabbah (ix. ), Nobah was born in Egypt, died after Moses, and was buried east of the Jordan. 2. Name of Kenath after its capture by Nobah. With Jogbehah, the town is mentioned in connection with Gideon's pursuit of the Midianite kings (Judges viii. 11). In I Chron. ii. 23 the place is called Kenath (comp. Rashi to Num. l.c.). 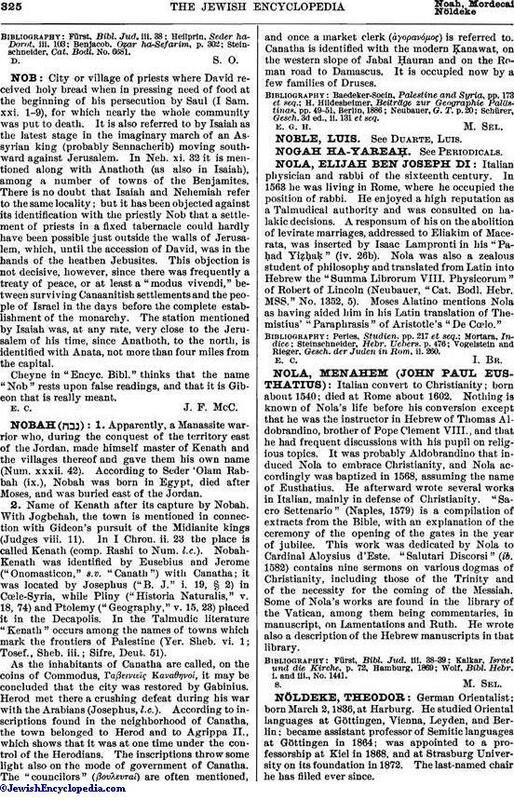 Nobah-Kenath was identified by Eusebius and Jerome ("Onomasticon," s.v. "Canath") with Canatha; it was located by Josephus ("B. J." i. 19, § 2) in Cœle-Syria, while Pliny ("Historia Naturalis," v. 18, 74) and Ptolemy ("Geography," v. 15, 23) placed it in the Decapolis. In the Talmudic literature "Kenath" occurs among the names of towns which mark the frontiers of Palestine (Yer. Sheb. vi. 1; Tosef., Sheb. iii. ; Sifre, Deut. 51). As the inhabitants of Canatha are called, on the coins of Commodus, Γαβεινιεῖς ΚαναθηνοΊ, it may be concluded that the city was restored by Gabinius. Herod met there a crushing defeat during his war with the Arabians (Josephus, l.c.). According to inscriptions found in the neighborhood of Canatha, the town belonged to Herod and to Agrippa II., which shows that it was at one time under the control of the Herodians. The inscriptions throw some light also on the mode of government of Canatha. The "councilors" (βουλευταί) are often mentioned, and once a market clerk (ἀγορανόμος) is referred to. Canatha is identified with the modern Ḳanawat, on the western slope of Jabal Ḥauran and on the Roman road to Damascus. It is occupied now by a few families of Druses. Schürer, Gesch. 3d ed., ii. 131 et seq.